Meijer is a Grand Rapids, Michigan-based retailer that operates 213 supercenters and grocery stores throughout the U.S. including Michigan, Ohio, Indiana, Illinois, and Kentucky. As a pioneer of the “one-stop shopping” concept, Meijer stores have evolved through the years to include expanded fresh produce and meat departments, as well as pharmacies, comprehensive apparel departments, garden centers, and electronics offerings. Learn more at: meijer.com. On the East Coast, lobster is a lifestyle. But in the Midwest, far from the ocean, a fresh lobster meal is a special occasion. Meijer’s in-store lobster tanks provide this delicacy to its customers. Unfortunately, some lobsters are lost due to the nature of how they must be handled, as well as all of the necessities to keep the lobsters in good health. As the only “living product” sold in the grocery department, Meijer needed a training course committed to treating these animals with the dignity they deserve. By understanding that the lobster appears to be tough, but is actually a sensitive, fragile animal, employees needed to be able to recognize the correlation between a stable living environment and a sellable, happy lobster. Meijer’s goal was to train every Team Member, responsible for proper care of this animal. As an outcome, they plan to reduce lobster throwaways, increase sales, and improve customer satisfaction. Allen Interactions designed what may be the first ever lobster-centric safety training in history! 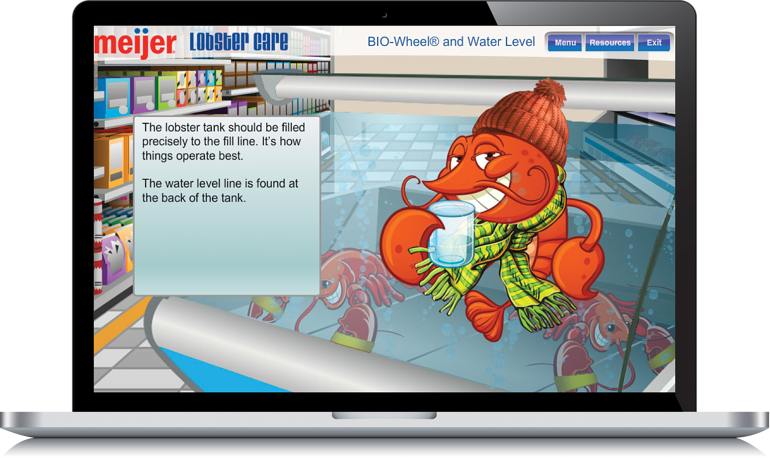 In the early e-learning modules, Marcel, a French Canadian crustacean with a gentle accent, serves as a tour guide through the tank. He points out the key measures (water level, temperature, salinity, and ammonia) that must be monitored to keep his temporary home safe and stress-free. With each mini-lesson, learners have the chance to practice reading results and selecting the appropriate corrective actions. 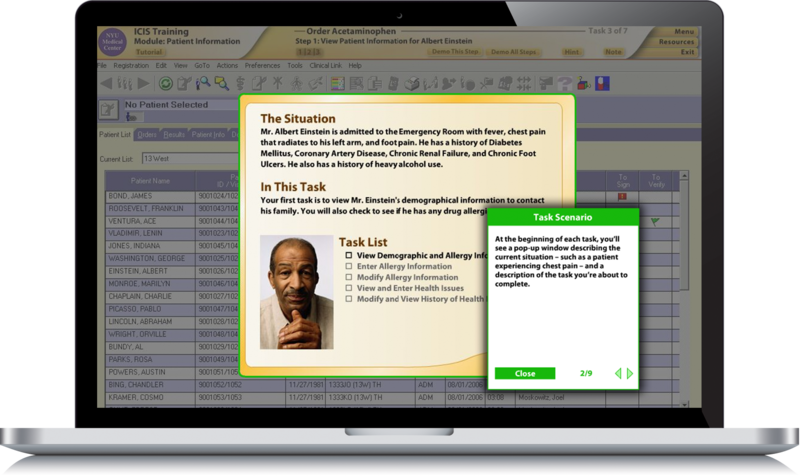 The main menu and visual feedback reinforce the use of a Daily Activity Log, which is an essential checklist and job aid on the floor. After working through the e-learning activities in the log and completing a drill and practice for each, learners arrive at the Lobster Tank Challenge. In this e-learning simulation, the learners must identify the area of the tank that needs attention and take the correct action. They practice using all of the tools and resources that will be available to them on-the-job to address nine challenges. Want to try our award-winning learning demos?